The first issue was published in 1971, and featured writing by Larry Herndon, James Stringham, and Steve Utley, art work by Buddy Saunders, and the comic strip "Aesir" by Buddy Saunders and George Proctor. Issue 2 (January 1971) featured articles by Don R. Powell, and Steven Utley, song lyrics by Howard Waldrop, part 2 of the comic strip "Aesir", an art portfolio by Jerry Mayes, and interior illustrations by Glen Brock, Kevin Crawford, Alexis Gilliland, Jerry Mayes, George Proctor, Buddy Saunders, Steven Utley, Raymond B.W. Wong, and Graham Wyatt. Letters came from Robert Bloch, among others. Cover art was by Jerry Mayes. The third issue (Spring 1971) featured prose by D. Bruce Berry, Thomas D. Clareson, Steven R. Miller, George Proctor, Steven Utley, and Harry Warner, Jr. (Horizons). Interior illustrations were by D. Bruce Berry, Tim Kirk, Dan Osterman, George Proctor, William Rotsler, Barry Saunders, Charlie Smith, Bob Stahl, Michael Teruya, and Steven Utley. Cover art was by D. Bruce Berry. Issue four (Summer 1971) featured art work by Darrel Anderson, Brad Balfour, and a portfolio of work from William Rotsler. The sixth issue (Spring 1972) featured prose by Alexander Andoverhause, D. Bruce Berry, Mike Glicksohn (Energumen, Xenium), Hal Crawford, Steven R. Miller, George Proctor, Darrell Schweitzer, and Steven Utley. Interior illustrations were by Darrell Anderson, Randy Bathurst, D. Bruce Berry, David Birdsong, Hal Crawford, Mark Gelotte, Steve Goble, Jim Hjort, Dave Locke (Awry), Greg Mabra, Dan Osterman, George Proctor, Don Ivan Punchatz, Gary John Reynolds, and Dave Taylor. 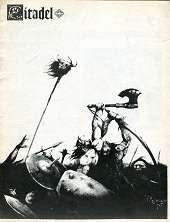 Cover art was by Mike Presley. This page was last modified on 26 June 2014, at 23:01.